Healing leaky gut is one of the most requested tasks in my pediatric nutrition practice. Many parents are surprised to hear me say that it is possible to repair leaky gut in children of all ages. But what really works? There is a lot of buzz about dietary approaches, probiotics, and supplements, and less good research on leaky gut than we’d like, especially when it comes to infants, toddlers, kids, or teens. However, after twenty years in my clinical pediatric nutrition practice, I can tell you what nutrition supports I’ve seen consistently work, and what strategies often fail. First, let’s get on the same page about what leaky gut is, and isn’t. It doesn’t mean there are actual ulcers or holes in your child’s intestine that are “leaking”. But it can mean that the intestinal wall has lost some integrity – and has become too permissive about the size of molecules that it lets pass into your bloodstream. 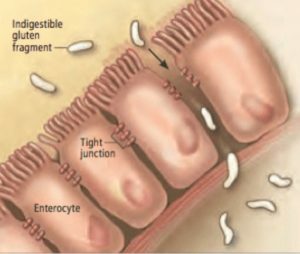 Another way you might hear leaky gut described is “intestinal permeability” or “hyper-permeability” – again, expressing a condition in which the intestine’s normally very selective, tight process for digesting and absorbing food has become, well, loose and sketchy! Practitioners – myself included – might scrutinize zonulin, stool microbe studies (microbiology culture or PCR DNA methods), inflammatory markers like calprotectin, or immune markers like immunoglobulin A in a stool sample to gauge gut environment. Some doctors may order a lactulose-mannose test in which patients drink a concentrated solution made of those sugars. How these two sugars, which are different sizes, are excreted in urine can give a measure of how permeable the gut is. For more on intestinal permeability tests and their pros and cons, click here. Food allergy and non-IgE food reactions may also be measured, which requires a blood test. Key To Restoring Leaky Gut Is…. Key to restoring a healthy gut is repairing “tight junctions” – these are the microscopic, traffic-cop structures of your gut. They form a tight seal between cells in the intestinal wall. When these junctions are injured, they break down – and larger-than-ideal molecules cross from the intestine into the bloodstream, triggering all sorts of reactions to stuff that your bloodstream and distant tissues were never meant to see in the first place. These might be anything from polypeptides (over-size fragments of food protein molecules that can masquerade as false hormones, false neurotransmitters, or invading antigens) to toxins, getting access your body from your gut, when they’re not supposed to. This permeability scenario is a catch-22, in that it can easily perpetuate itself, as more injury persists in the gut. The intestine is our largest immune system interface with the world outside the body – so leaky gut can also wreak immune havoc, from autoimmune problems to frequent infections and illnesses. What injures the gut? Lotsa stuff – and, making this harder is that leaky gut symptoms are often diffuse and insidious. They can evolve gradually, or with an abrupt onset that never quite resolves. Leaky gut can trigger symptoms in the GI tract of course, but also far from the gut, like headaches or joint aches, stiffness, pain, fatigue, or frequent colds and infections. Most kids have had at least one of the items on this list. But that last one is key. In itself, underweight can cause intestinal permeability especially in children. You can address all the other triggers, but if your child is underweight – that is, more than fifteen percentile points off his or her expected pattern – your child’s gut can remain “leaky”. There simply isn’t enough raw material and energy on board for that tissue to repair itself, while your child is also trying to grow. Here’s the rub: Generally, nobody scrutinizes your child’s growth pattern that closely (I will be honest and tell you that I even see gastroenterology work ups overlook this level of detail – and I routinely read my patients’ reports from their GI specialists nationwide). Without defining your child’s actual expected growth pattern – that is, where your child should be today given parental stature, pregnancy history, birth/delivery history, and growth history since birth – then you don’t know if your child is underweight or undernourished. You can learn more about that here. I meet many children who are underweight. Sometimes it’s caused by families placing kids on diets that are too restrictive. Or some families have become so traumatized by frightening reactions to foods that they just don’t know how or what to feed their children – so, they don’t. Sometimes it’s caused by a well meaning practitioner who didn’t monitor growth and food intake, because they’re focused on lab tests and supplements instead, gave no guidance on what to actually eat, and encouraged a restrictive diet without effective replacements for foods taken out. I have also seen underweight caused by reflux medicines, which can diminish appetite and digestion when used for more than a few weeks or months. When it comes to picky eating, this too will drive growth status down in kids, injuring the gut too via underweight and poor diet. The flip side of this coin is assessing what your child eats – how much and what – and the only way to discover if your child eats enough non-triggering, nourishing food is to assess a food diary (part of every new patient intake I do), and then align it with the growth assessment. The food your child eats is the lumber that will be used to do the gut repair – so it has to be the right stuff, in the right amount. Supplements (including glutamine, which is a helpful amino acid but not an energy source), herbs, and probiotics don’t provide this raw building material. I meet a lot of kids who have been given a lot of supplements, lab tests, antifungals, special diets, and measures to repair leaky gut. But they’re still struggling – because this essential growth and feeding part gets lost in the shuffle. But put the right feeding plan with the right supplemental supports, and boom – now you’re talking! Balance gut microbe environment with herbal or prescription agents to directly address fungal burden, Clostridia burden (even commensal strains can be problematic if they far outnumber other helpful strains), Strep or Klebsiella, parasites, protozoans, and whatever comes up on testing. Combine this with probiotic supplementation that matches your child’s stool studies. My preferred tools for assessing this are GI MAP and Doctors Data Stool Microbiology. Customize the special diet to your child. Skip dogmatic, one-size-fits-all approaches. Give enough protein! Kids may need anywhere from 1 to 2 grams of protein per kilogram bodyweight per day depending on degree of growth impairment. Give the right protein; assess first which proteins are triggering with lab studies. Replace trigger proteins with equal or better value non-trigger protein sources, and keep them varied. Use free amino acids. Supplementing with amino acid mixes that give all 8 essential amino acids (and not just glutamine) has been a big bonus in my practice for kids who need deep gut repair. Formulas and powders are available. These give the gut direct access to building blocks for new tissue growth and repair. I use anywhere from 5 to 15 or even 30 grams daily of this protein source, depending on a child’s needs or status. Caveat: These won’t work well without an adequate total diet around them to support energy needs. Give enough total food including “clean” (non sugary) carbohydrates, which are crucial for growth in children (carbs preserve protein for structure and function, and keep it from being burned for energy) and ample healthy fats and oils. Kids can need 4-6x more calories per pound than adults, depending on age and growth status. Don’t feed them like little adults – give energy-dense, nutrient-rich food. Mastic gum, licorice root, zinc carnosine, glutathione, mineral-rich foods or products like Restore are just a tiny sliver of the thousands of products that can aid gut tissue repair. Work with a knowledgeable provider who has used these in children before. Using these tools is a routine part of my practice. Correct sleep pattern so your child can sleep deeply and wake rested. Sleep is when our organs are busy with repair and clean up. Hint: Children who are underfed tend to sleep poorly and wake more often. Minimize stress in your child’s world. Don’t discuss “leaky gut” with younger kids and don’t frame food or their bodies as problematic. Use positive language and emphasize the power to heal, which we all have. Give it time (like, months), be chill, and remember that your child’s body is a miraculous thing with its own innate drive to grow, repair, and heal. Using rigid diet strategies for growing kids can be too restricting to support growth, gain, and gut repair. Yeast free diet, GAPS, ketogenic diet, AIP, SCD, Paleo, or Body Ecology all have merits (and devotees! ), and I use components of all of them in my practice. But in themselves, none of these were created for use in children (except ketogenic diets for seizure control) and can fail when children are already struggling to gain or grow. If you’re not seeing good growth, gain, and progress in behavior or food reactions with one of these strategies within 2- 4 weeks, or if initial improvements lapse quickly, then it probably isn’t right for your child. Customize to your kid instead! Needing your child to like any of this, including taking supplements, having blood draws, or accepting different foods. You’re the adult. They’re not going to make it easy for you – that’s a given. Hint: Picky appetites can improve with addressing these three steps – don’t assume your child “won’t eat that”. Staying on reflux medicines for months at a time. These will work against your gut healing efforts by keeping pH in the stomach too weak to initiate good protein digestion. They will also cause your child to feel less hungry over time, to eat less, and to become more picky – thus leaving your child underfed and unreplenished for the task of gut repair. Learn more about the downside of reflux medicines here. Using glutamine, vitamins, minerals, or lots of supplements before you situate the right feeding strategy for your child. Feeding strategy means knowing what foods to use, how much and which sources of protein, fats, and carbs, and for how long, to support your child’s expected weight and height. Being aggressive with fermented foods, probiotics, or too much Saccharomyces boulardii. These can backfire if used for too long or at too high a dosage, and may even start to create their own dysbiosis or discomfort. Leaving fungal, parasite, SIBO or SIFO, or other dysbiosis untreated or under-treated. This can interrupt appetite, digestion, and stooling and keep tight junctions from sealing up. Giving up after 2-4 weeks. This is a restore and repair effort that may take months, depending on how long your child’s gut has been in the weeds. Want help? This is a lot! Let me sort the best options for your child. Contact me today to set up a time to work with me remotely or in person. Or, peruse my options for books and on-line-course support. Yes, leaky gut can happen regardless of weight status. Do you work with kids with nut allergies? Wondering if you do consults. My 8 ye old has been dealing with EBV and gut issues for 2 yrs now. Jan this year started the worse where she had flair ups and unble to walk on her left foot or use her left hand. She was a competitive gymnast and was getting sick after every meet. We now believe it’s her gut effectingbthe immune system and nervous system. Medical specialist have no clue. She has gotten some relief from a clean diet and supplements. We would really like a consult to see if we are in the right track and what supplements we should add or take away. Hi Mindy, yes I do consults and these can be remote or in-person. For details, fees and options visit the “Work With Judy” section of my site. just wondering your thoughts on “restore” for the gut. We do use Restore here at Flatiron Functional Medicine and in my practice (Nutrition Care For Children) – it can be useful, though best started in very low doses to avoid Herxheimer reactions.